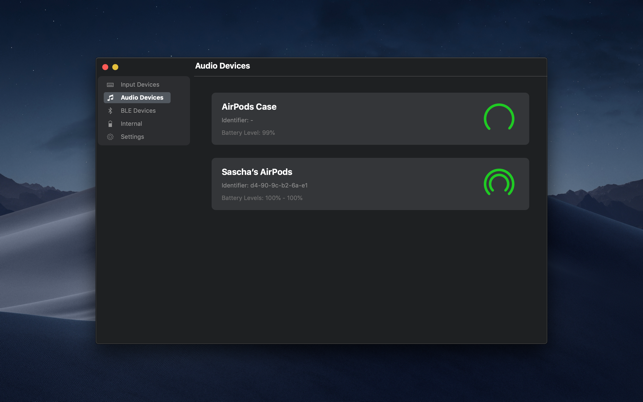 The App Magic Battery shows the battery level of supported input devices and headphones that are connected via Bluetooth in the menu bar. Internal batteries are also supported. You can pair your BLE devices. 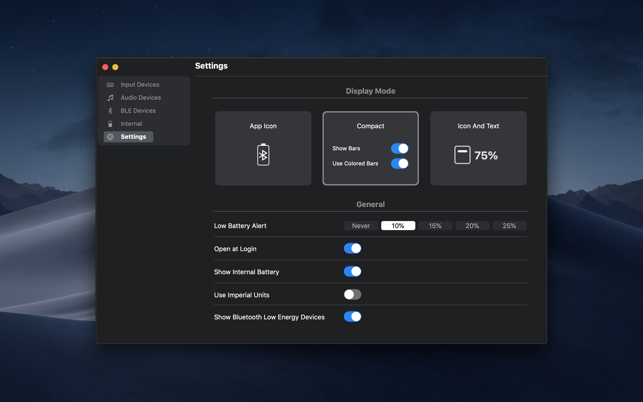 If the device implements the Battery Service, the battery level will be shown in the menu bar (you can also ignore devices). This feature is great for displaying the battery level of your iPhone or iPad! 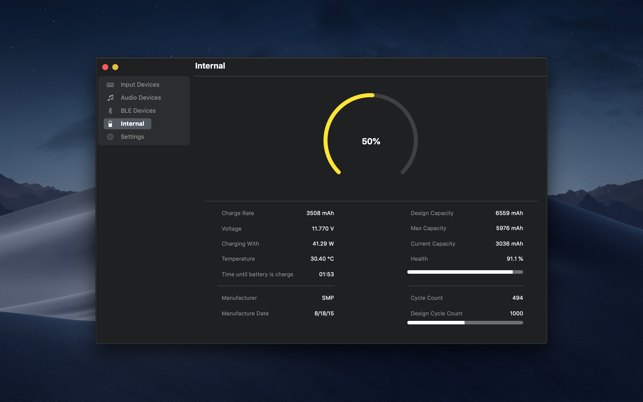 • Modern GUI for displaying connected devices and their battery levels. • Shows the percentage of the internal battery including how long the battery will last. • You can choose between a detailed, a compact or an icon-only view. In the detailed view, the battery level is shown next to the device icon. In the icon-only view, the battery levels are shown once the menu of the app is opened. The compact view shows all the information in a way that very little space is used. 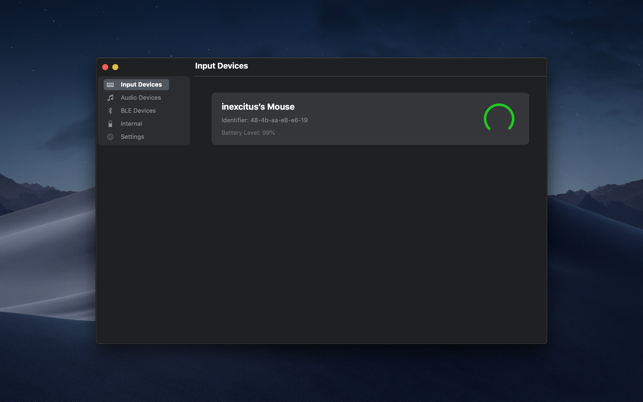 • Connected or disconnected devices are detected automatically. The view is then adjusted accordingly. • Support for Bluetooth Low Energy (BLE) devices. 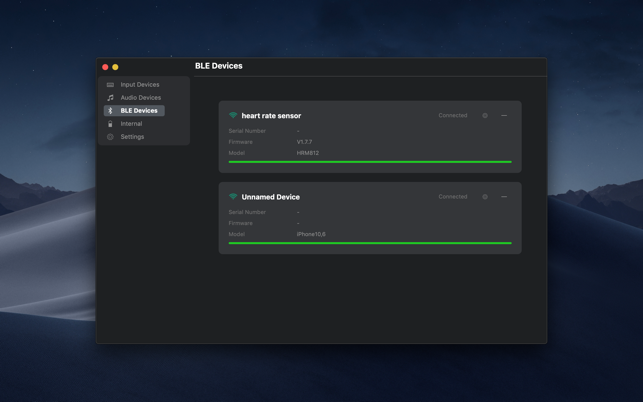 Use the BLE Devices page to connect and disconnect to BLE devices to show their battery levels. • Receive notifications when the battery level of a device is below a certain value. The exact value can be configured. • This app supports the Dark Mode of macOS Mojave. • Support for auto-start: The app is started as soon as the user is logged in (optional). 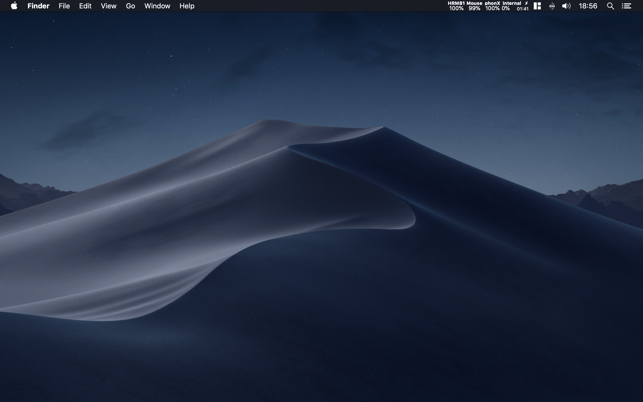 All products that are supported and were listed above are a registered trademark of Apple Inc.
• The app was optimised for the latest update of macOS.